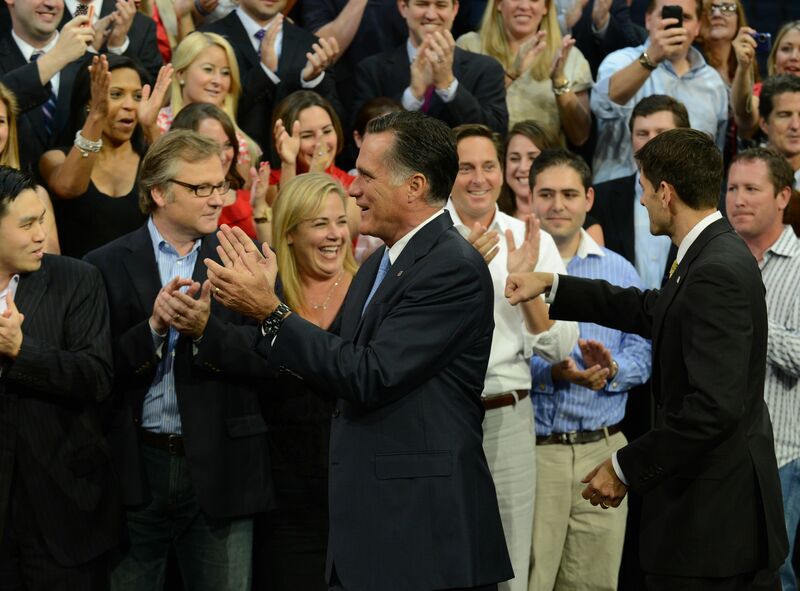 By Eric Stirgus on Friday, August 31st, 2012 at 6:00 a.m.
Republican Party president nominee Mitt Romney and his running mate Paul Ryan greet supporters at the party's convention in Tampa. President Barack Obama quipped that Republicans have said some "wonderful" things about him during this week’s national convention in Tampa. Speakers contrasted the president’s record to GOP presidential nominee Mitt Romney’s. Others claimed Obama has never worked in business and doesn’t want farm kids to do basic chores. PolitiFact looked at those claims and others. And check our Facebook page throughout the day. We update it with new convention fact-checks morning and night. Read summaries of some of our latest checks below. Look for a roundup of our fact-checks of Romney’s speech in Saturday’s newspaper. U.S. Rep. Paul Ryan (R-Wis.): In Massachusetts under Mitt Romney, "unemployment went down, household incomes went up," and the state "saw its credit rating upgraded." As part of the Republican Party’s continuing effort to celebrate business success and private-sector ingenuity, Ryan offered Romney as Exhibit A during his convention speech on Aug. 29. "He was the Republican governor of a state where almost nine in 10 legislators are Democrats, and yet he balanced the budget without raising taxes. Unemployment went down, household incomes went up, and Massachusetts, under Mitt Romney, saw its credit rating upgraded," said Ryan, the GOP’s vice presidential nominee. PolitiFact fact-checked the household income trends and found an increase of $5,500 under Romney without considering inflation -- but a decrease in real dollars after adjusting for inflation. On unemployment, PolitiFact previously tested a Romney claim that he reduced Massachusetts unemployment to 4.7 percent. We rated that claim Half True; the number was correct, but we ruled that Romney did not deserve as much credit as he was giving himself. The employment situation in Massachusetts was subject to many factors, not just the governor’s policy. Finally, the credit rating. The state's credit rating rose from AA- to AA. On balance, we rate this triple-header a Half True. U.S. Sen. John Thune (R-S.D. ): The Obama administration "even proposed banning farm kids from doing basic chores." President Barack Obama has enacted a policy that only a Bart Simpson would love, according to one GOP convention speaker. "The big-government bureaucrats of the Obama administration have set their sights on our way of life," Thune said during the Republican National Convention in Tampa on Aug. 29. "Instead of preserving family farms and ranches, President Obama's policies are effectively regulating them out of business. His administration even proposed banning farm kids from doing basic chores!" Obama doesn’t want farm kids to do basic chores? For decades, a parental exemption has allowed children to do any job on a farm owned or operated by their parents. The U.S. Labor Department, hoping to reduce child labor deaths, proposed changes to limit kids from working on dangerous equipment. The proposal did not include children who worked on their parents’ farm. The Labor Department eventually decided to scrap the proposal. Thune said that the Obama administration "even proposed banning farm kids from doing basic chores." It's ridiculously false to suggest it applied to children of family farmers and even sillier to say it applied to "basic chores." Florida Attorney General Pam Bondi said women care most about jobs and the economy. Women and Mitt Romney see more eye to eye on the issues than the polls and press would have you believe, says Florida Attorney General Pam Bondi. As the Republican National Convention convened in Tampa, CNN host Wolf Blitzer asked Bondi if she thought debate over abortion rights played into why Obama leads Romney with women. He pointed out the party’s policy platform, which calls for a "personhood"-style amendment that would define life at the moment of conception. "Wolf, when I’m around the country, women care about the same issues as men, and that’s getting jobs, keeping jobs," said Bondi, who was also a convention speaker. We’ve heard this retort from Republicans throughout this election cycle as reproductive rights issues have at times dominated the news. PolitiFact found polling that shows the economy was, by far, the most important issue to women. Unemployment was second. Bondi is right that women, like men, place the most importance on economic issues this election cycle. We rate her statement True. U.S. Sen. Rob Portman (R-Ohio): President Barack Obama has "never even worked in business." When Obama was seeking the presidency in 2008, Republicans frequently derided his career experience, saying it was limited to a scant four years in the U.S. Senate, some time in the Illinois Senate, and having been a "community organizer" in Chicago. In his speech to the delegates, Portman, believed to be a finalist for Mitt Romney’s running mate, contrasted Obama’s work experiences with those of Romney, whose work has primarily been as a business executive. "Then you have Barack Obama, who never started a business -- never even worked in business," Portman said. A look at Obama’s resume proves otherwise. In 1983 and 1984, Obama had a stint as a research assistant at Business International Corp. in New York City, where he helped write a newsletter. Obama has had less experience in the private sector than Romney. However, Portman went too far when he said that Obama has "never even worked in business." We rate the statement False.